This Friday 2nd September the museum is opening late, for free, so that you can explore the design of the Mayor’s New Bus for London. 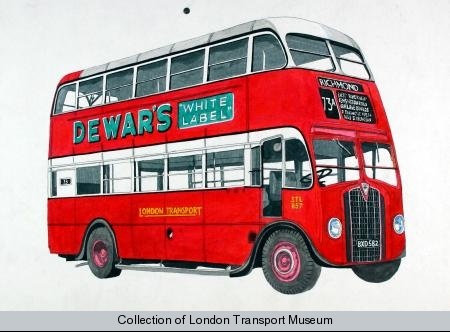 This poster from 1979 celebrates 150 years of London’s buses. It starts with the old omnibus and goes through to the T-type Titan. 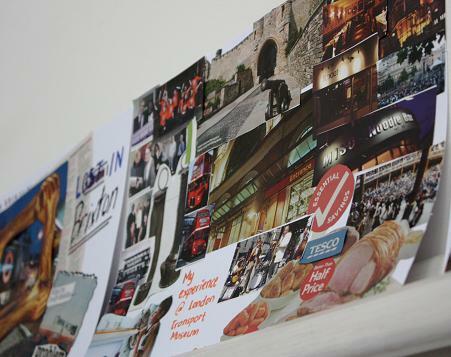 Across the bottom are pictures of the staff in uniforms, tickets and machines and the bus stops. I love the original pen and ink drawings that Mike did for each element of the poster. They are really delicate and draw your attention to the design details. My favourite bus stop is the one in the middle – it would be quite happy in Narnia! Which do you like and why? Published by London Underground Ltd, 1994. Commissioned by Art on the Underground. Paula has also sent me some photographs of her with the posters. What tunes would make a good soundtrack to this poster and get your toes tapping? 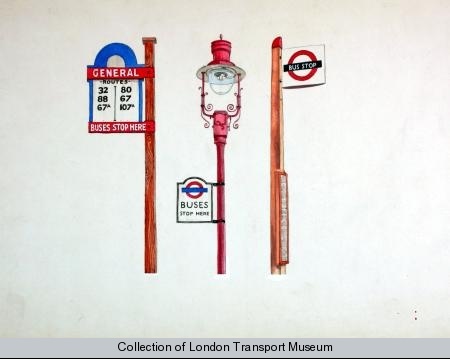 Every few months London Transport Museum installs a new Poster Parade which showcases 20 posters from our collection of over 5,000 different poster designs. Curators and Museum Technical Assistants have to arrive at the museum early to make sure the display is ready for when the museum opens. The poster parades are usually themed. This can be to showcase the highlights of our collection, mark the change of seasons or even to support another exhibition featured in the museum. This month’s poster parade has been sponsored by CBS Outdoor, a major supporter of the Museum, who have selected and interpreted the 20 posters that are currently on display. CBS Outdoor are the advertising company responsible for the London Underground, bus, tram and rail networks. The poster parade can be found on Mezzanine Level 1 of the Museum. Next week it’s TfL’s Safety & Citizenship Be Safe Week at the museum – we’ve got free design activities for families to join in. 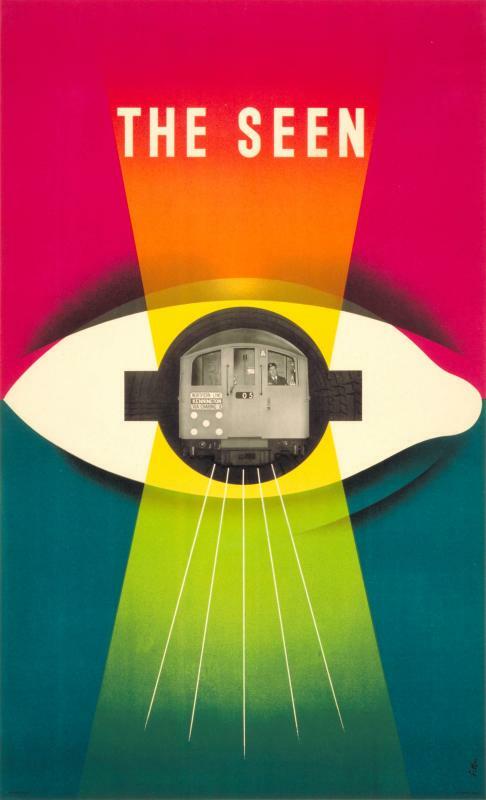 Back in the 1930s, safety was high on the agenda too as the Publicity Department persuaded people that the Underground was safe and speedy. You know you’d be super safe with this striking Knight of the Underground around to protect you with his mighty Roundel shield! What do you like most about this poster? Nearly two years after first starting the Young Consultant project we have witnessed so many changes in the museum and with ourselves. Being a Young Consultant has been more than just a job, it has also been a sea of wider opportunities, learning experiences and the beginning of many friendships. Never has the phrase ‘the world is your oyster’ been more applicable than at London Transport Museum. 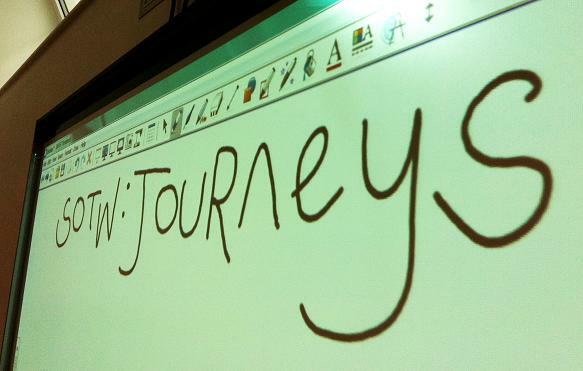 I believe this because of three main things I have learnt during this experience. Firstly, I have a greater understanding of what my strongest skills are. By working on a variety of projects, such as giving presentations, facilitating focus groups and interviewing artists, I have had to rely on my communication skills and in particular public speaking. This skill will greatly support my future career aim of becoming a barrister, which I have also been supported in pursuing by the staff here at LTM. The same can be said for the other YCs. We all have many different aspirations, and by having CPD and project evaluation meetings with the vivacious Vicki Pipe and spectacular Steve Gardam we have been supported and encouraged to achieve our goals. Secondly, this project has allowed me to see first hand the positive contributions that young people can make to society. Although young people often receive negative press, especially in light of the recent UK riots and looting, we feel that it is necessary to emphasise that there are many young people making positive contributions to their communities. For example, the Young Volunteers at LTM who deliver family activities for visitors or even the large number of young people involved in national Stories of the World projects. I feel privileged to be a part of this group of young people and I look forward to a continuous legacy of youth participation. Last week the wooden carriage body was delivered to the Festiniog Railway engineering works at Boston Lodge for further assessment. 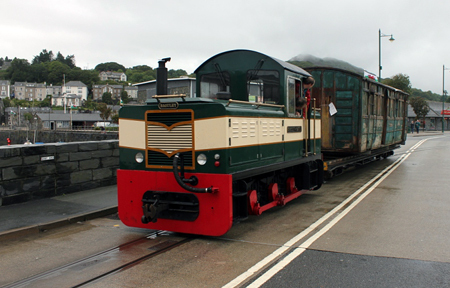 The road transfer from the Museum Depot took place over a two day period, with the final part of the journey involving use of the narrow gauge railway line. The photograph shows the carriage being hauled as a special ‘out-of-gauge load’ through the local town of Porthmadog on its way to the workshop. We have a huge poster collection at the museum, with some going back over 100 years. 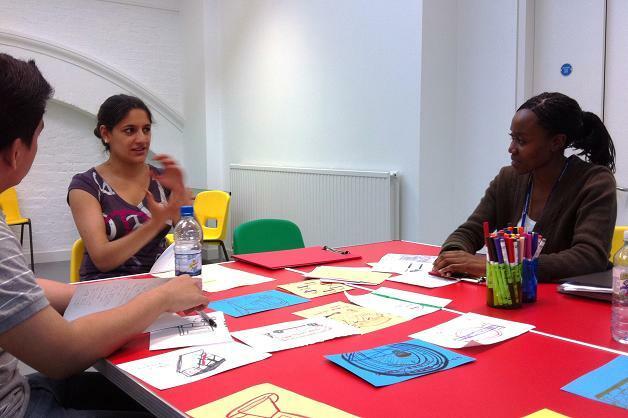 I’ve just started working here as a Community Curator running a project called Access to Art. I’m going to be working with lots of people to bring these posters to life – finding fresh ways of looking at them, different stories to tell and new ways to share them. You can explore over 5,000 posters on our collection online… but where to begin?! How about one a week? Starting from now we’ll be picking out a poster each week which highlights something we’re working on within the museum – things which are happening around London and other hot topics. Needless to say, we’d love your feedback on them. So… on to our first Poster of the Week! This Sunday 14th August is the London-Surrey Cycle Classic road race – one of the all important test events in preparation for the 2012 Olympic and Paralympic Games. So we’re going for a cycling theme with this gem ‘Motorcycle and Cycle Show, by Andre Edouard Marty, 1933’ promoting a show at Olympia. As well as designing fab posters, he produced gorgeous fashion illustrations for magazines like Vogue, and designed sets and costumes for the theatre. We’re particularly loving the co-ordinated green scarf, gloves & shoes! What are your favourite cycling accessories? The curatorial department has been keen to support the next generation of curators and conservators and as a result has achieved a highly active internship programme. Over the past 12 months the curatorial department has welcomed 9 interns from 6 different university postgraduate courses into the Museum. These interns have been working alongside our curators on both Collections Management and Collections Development projects both at the London Transport Museum in Covent Garden and at the Acton Depot. The department has just played host to a conservation student, Charlotte who has been involved in many activities at the museum including helping the curators install a Poster Parade and monitoring for pests in the galleries and at the depot. 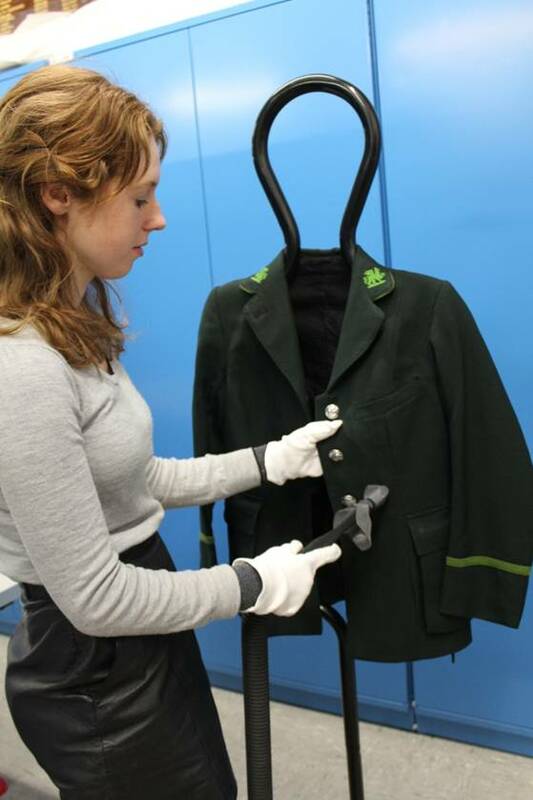 Her main task however has been to work with the Collections Management team at the Acton Depot with the uniform collection. Charlotte has been undertaking a collections review and has been assessing the conditions of all our textile collection, cleaning and freezing items where appropriate. The curatorial department has also just welcomed two new postgraduate students from the University of Leicester who will be working in the department until September. Following on from my previous post, the short film about Tooting Broadway station is now available to view online, via London Transport Museum’s new YouTube channel. Enjoy! During the induction week young volunteers were given the opportunity to become familiar with the Museum. Over a period of four days the young people took part in a variety of different activities and met with different members of staff to help build up their knowledge of the Museum and better understand how it operates. In particular they spent time developing their own map of the Museum, choosing significant objects from the collection to help navigate their way around each gallery. They had an opportunity to speak with Nadia Adira (Visitor Services Manager) and find out how the Museum runs from an operations perspective; as well as spend a day with Community Curator Michelle Brown, who delivered a creative activity that helped the young volunteers explore their own personal connections to the Museum’s collections.